The Greater Accra Region representative of Aduana Stars, Isaac Koomson does not agree with the alleged proposal to play league matches at only selected venues. 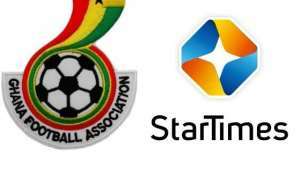 Broadcast rights holders StarTimes are said to have suggested to the Ghana FA to appeal to the clubs to abandon their preferred home grounds. This, the reports say, will help the broadcaster make more live games available. StarTimes believe they will have difficulties telecasting more live matches due to their limited resources, particularly the fact they have just one Outside Broadcast van. However, Koomson is not in support of that and has descended heavily on StarTimes and football association. “I don’t blame Startimes but those who obliged to the deal and signed for it, even the five years we heard was ridiculous being their first time and you went ahead and signed ten years which is total madness and look at where we are now,” he told Hot Fm. The 2017/18 Ghana Premier League gets underway this weekend.